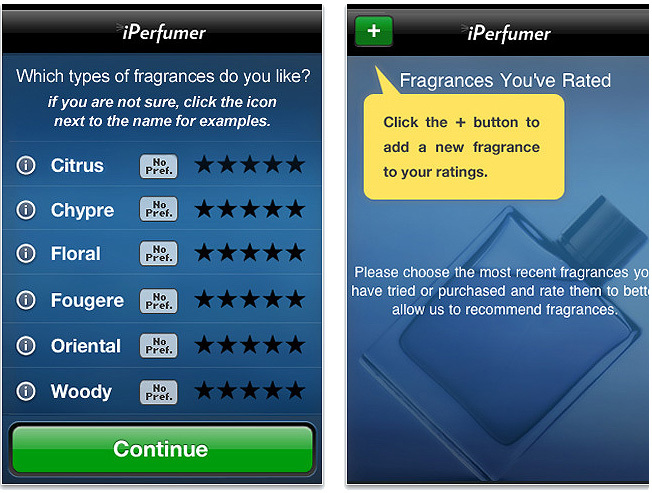 Givaudan, the worlds most respected fragrance manufacturer has released an iPhone App unimaginatively titled: iPerfumer. It’s for the iPhone? Better stick a small “i” in at the beginning of the name then *yawn*. Having said that, I had barely finished scrolling to the bottom of the press release before I’d scooped up my iPhone and zoned in on the App Store. Combine my iPhone geekery with an undying fascination for the perfume world and it was downloaded and installed faster than a fat kid at a cake buffet. Now, despite my fascination in perfumes and scents… I’m a total n00b. I’m clueless, which is great… ‘cos I’m guessing this App is aimed at people like me who struggle to navigate the complicated world of perfumes. 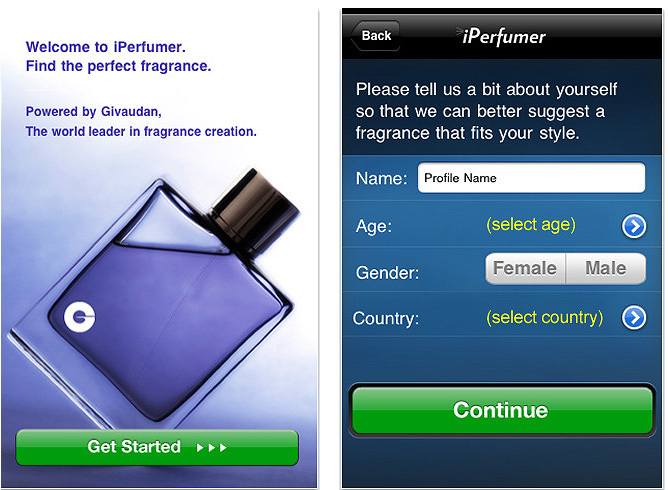 The App itself is pretty basic, you fire it up… enter some personal details and preferences (I had to look up some of the fragrance types – chypre? fougere? wassat!) and finally start ‘rating’ fragrances that you’ve tried, with 5 stars being top marks. The first thing I noticed was that once I’d entered my personal preferences, there doesn’t seem to be a way to ‘go back’ and edit them. I’m stuck with having given ‘Oriental’ 3 stars, when I should have given it more. Make sense? The only way I can see to fix this is to delete my profile and start from scratch. Frankly, I can’t be arsed. It also appears to have a limited database of perfumes… I’m hoping that as time passes, the clever people at Givaudan will update the App to include more and more fragrances. I couldn’t rate anything by Annick Goutal… still, it let me score SJP Covet (go figure!) – and no, I’m not telling you what score I gave Covet, you’ll ban me from ever owning another perfume! Once you’ve rated as many perfumes as you can remember owning or sniffing… click the “Recommend” button at the bottom and the App takes just seconds to whizz up a list of recommendations based on your previous input and ratings. Clever no? I’d have loved to have been able to browse through the perfumes in the App’s database… it seems that you can only really access a fragrance’s details if you know the name to search for it directly or get recommended it by the App. Seeing as I like ‘floral’ perfumes, it would have been nice to have been able to browse through a category devoted to these scents. It’s all about making the database accessible in as many ways as possible to the user. 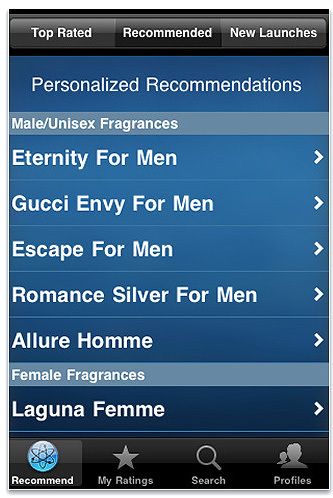 I’ll be honest… I don’t know enough about fragrances to tell you whether the recommendations are much cop. I had a nice selection of floral/oriental fragrances in my list (the image above is a generic screenshot) including Armani Sensi, Ralph Lauren Notorious, Trish McEvoy Gardenia Musk and Serge Lutens Daim Blond. But having never smelt any of those, I’ll have to follow my nose to my local counters to see what I think. Overall, iPerfumer is a nifty little App that occupied a good half hour of my time yesterday. I had fun rating and reading little snippets of info about fragrances I’d never heard of before. Ultimately, it needs a bit of work and a lot of updating. But the potential is certainly there, and if anyone can do it… it’s Givaudan. I’ll be back to let you know what I think of it’s recommendations… if I like the suggestions, then this App will be coming with me on many a Beauty Hall tour! Basenotes is my go-to for fragrance info. Also Perfumed Court. I’m impressed that the app. knows about Serge Lutens as it’s over 100Euro a bottle and he only lets you buy it if you make a solemn vow that you’re not an undercover fragrance espionage agent. Well, he rang me to check me out anyway. I love Basenotes, but I get really confused on there and invariably log off feeling quite stupid. LOL@Serge Lutens! That sounds like a total time sucker for me. I’m frag-mad. Does it mostly recommend/rate very popular fragrances?